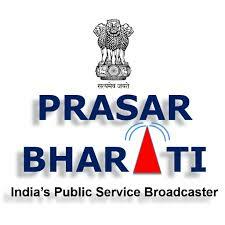 Prasar Bharti Recruitment 2018 - Content Manager Posts. Prasar Bharti Recruitment 2018, Prasar Bharti has Been going to announces employment notification for Recruitment Of Content Manager Posts. So, All Eligible And Interested Candidates May Apply Online Before Or On 15th February 2018. More details of Prasar Bharti Recruitment like Qualification & Eligibility Criteria, Selection procedure, Age Limit or how to apply are given below..
PG Degree/ Diploma in Journalism/ Production or Degree/ Diploma in Computer Application. Rs. 25,000 /- Per Month. Age Limit : As Per Notification. Selection Process : Selection will be based on Written test/ Skill test. Applicstion Fee : Candidates have to Pay Rs. 400/- through Demand Draft in favour of DDO, DD News,payable in New Delhi. How To Apply : All Interested Candidates may apply in prescribed application form along with Self attested copies of all documents send by Speed post/ registered post or by hand to Deputy Director (HR), DD News, Doordarshan Bhawan, Tower-B, Room No-413, Copernicus Marg, Mandi House, New Delhi – 110001 on or before 15.02.2018. Last Date for Submission of Application form : 15.02.2018. Candidates may go through this Official Notification to get other relevant details about Prasar Bharti Recruitment 2018. Stay in touch with us to get latest Updates for more information On Prasar Bharti. Hope Our Readers are able to get all Important Details about Prasar Bharti Recruitment Board Recruitment Notification 2018. Aspirants Can Comment us their related query below. Our Team Member will reply you as soon as Possible.